communication apprehension, and conflict mediation. Although hardly exhaustive, the meta-analyses address issues central to achieving educational goals. We consider issues such as interpersonal relationships, affinity between students and teachers, listening behaviors, student motivation, teacher influence, and power. 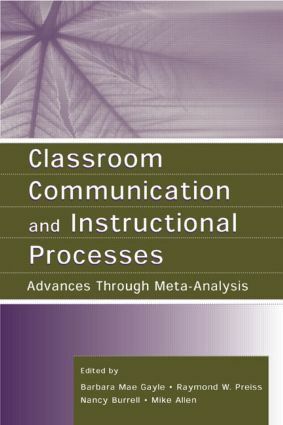 Because this research reflects the nuances of classroom interaction, our remarks are offered as a foundation for the metaanalyses in this part of the volume.